Financial services. New name. New logo. New brand. A group of finance professionals started a new business entity and we worked with them to create a new brand to go with it. We helped this finance client create a new name, logo and branding to launch their new business in the right way for a premium market. Building a new brand from the ground up is very rewarding. Thinking up new names is a great challenge and with this project we had strong directions. That meant a lovely name and then plenty of great logo and brand design options, and a happy client. The people behind Trove approached us with their plans to start something new. We worked closely with their key people to develop a Communication Strategy and then developed naming options before moving to logo and brand design. Trove work with high net worth individuals to protect and grow their wealth. The Trove name reflects those core services and benefits. Look up the meaning of Trove and you might find something like this - Trove. A store of valuable or delightful things. Or, a valuable collection, treasure. 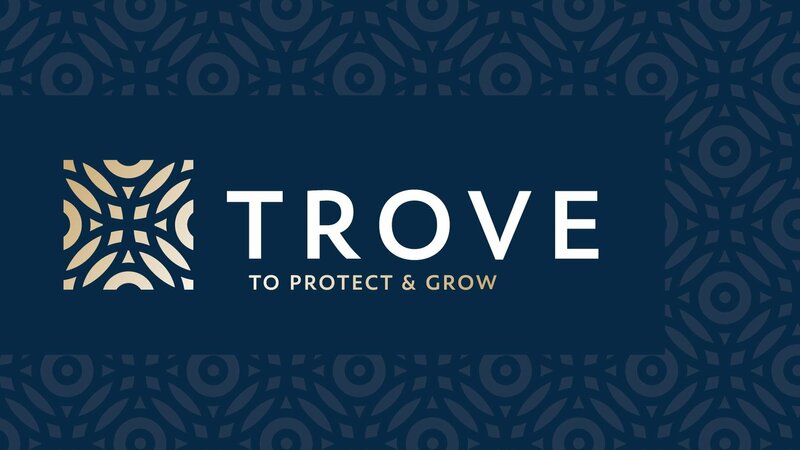 For a business that is dedicated to helping people build, protect and grow their wealth, the word Trove is a very nice fit indeed. Of course, we didn't just come up with the new name in five minutes, we followed a process for naming brands and businesses that we have refined over several years. First we talk at length with the client to get their input, ideas, preferences and insights. From this feedback we develop a number of directions or topics. Then, under each direction, we build up a list of potential names. Of course, some of them are no good at all, but the process of exploring, assessing, discarding and refining always leads us to some strong options. When we have our short list of names and recommendations, we again meet with the important people (the clients!) and take them through the choices. We guide them towards a final decision that will work for them and their new business, have meaning for the people they want to engage with, and hopefully tick a few boxes at The Cut too. Trove was born from a previous business entity, so not only was Trove new, the people starting Trove did not want any connection to the other business. 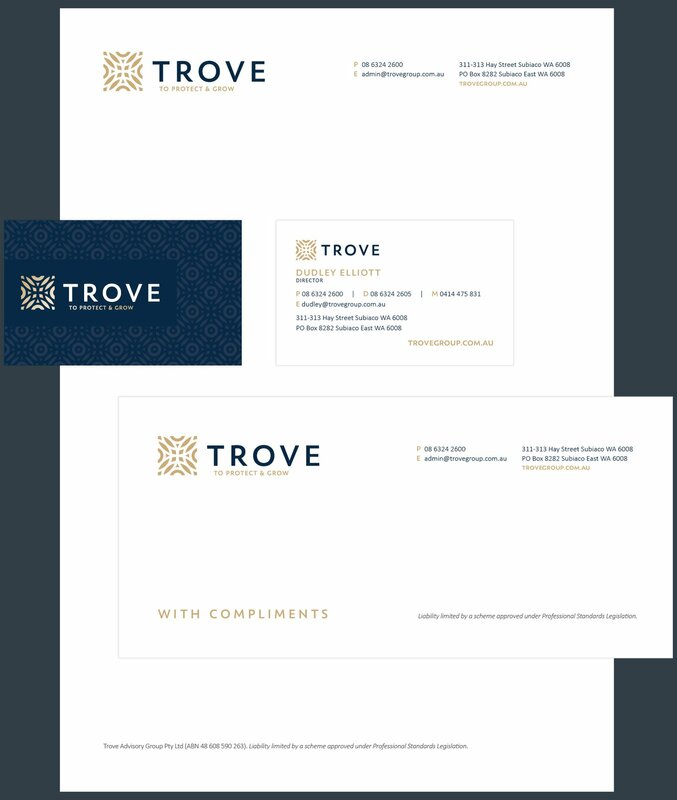 So the Trove process was very much start from scratch, there was no 'rebranding' involved, where clients often like to retain a reference or a 'tribute' to the old brand. With the communication strategy in place, the new name decided upon, and the clients getting happier and more excited with each passing day, it was time to get started on the fun stuff. The design. The logos. The pretty pictures. 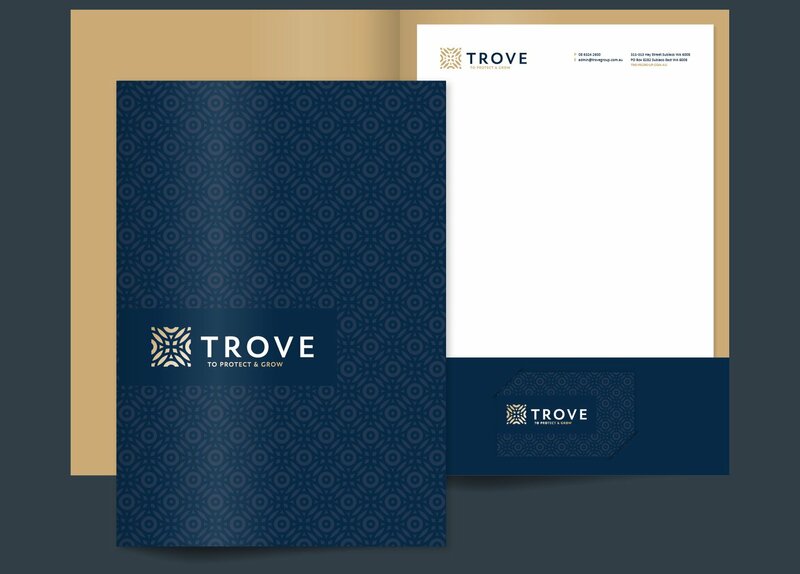 Central to the visual brief for Trove was a need to create a brand that looked not only well established and worthy of trust, but also premium and a good match for the successful people who are the core clients. Well, there's not much point talking it up, because you can see the final outcomes right here. We felt we hit the mark right on the head, and recently, one of the Trove directors was kind enough to let us know that their name and branding is being well received and sparking interesting conversations with the people they meet. That's great news, because we want people talking about the brands we work for. After all, that's the whole point isn't it? If you need great brand and logo design for a new business, or want to refresh an existing business, speak to our brand designers today, we're here to help.